At the beginning of the New Year I made a a few lofty goals/resolutions. One was to take Kelly Rae Robert's online class Flying Lessons: Tips +Tricks To Help Your Creative Business Soar. A few weeks ago I got an email saying this was the last time she would offer the ecourse, thought about it for half a second, and decided it was one resolution I really wanted complete. It just started this past Sunday and I'm on board. I have a creative business right? I have a blog, an Etsy shop, and a workspace to call my own...not a bad start but I lack goals and have so many fears about possible failure and success that I rarely get anything off the ground. 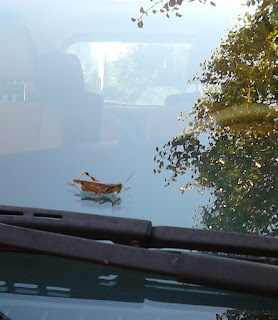 Today, driving home from the day job I noticed a hitchhiker on my wiperblade. Kept thinking at each stop I made that he would take his leap, but he didn't. Instead he stuck with me all the way. Once home, I snapped a quick pic and left him him peace. green grasshoppers indicate fresh starts (new beginnings), as well as the concepts of youth, rejuvination, sentimentality, nature, adventure, growth and health. Well then.... you go girl. I have complete faith in you and I bet the OL class is a great one.Talk to you soon. Well then...indeed! I'd say it's time to take off and fly. I can't wait to hear all about your success! Good for you! I know you can make your business whatever you want it to be. I'm always timid when trying new things. I sometimes take so long to implement that it never really happens. I'm anxiuos to see where this takes you. Just catching up with reading Angie. Serendipity sometimes comes calling when we least expect it. Grasshoppers have always seemed hopeful to me. I am curious about this online class too.